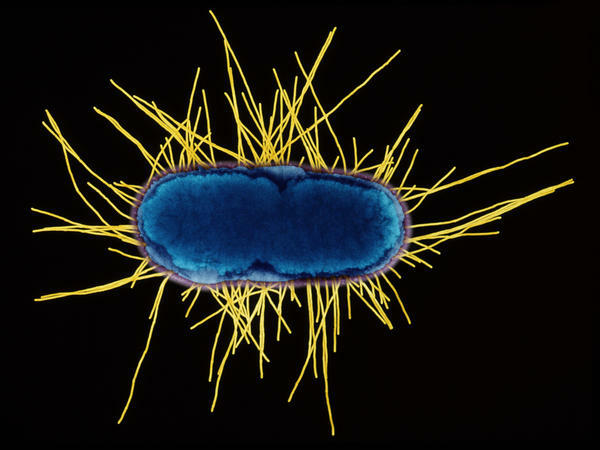 Colored transmission electron micrograph of a section through an Escherichia coli bacterium. 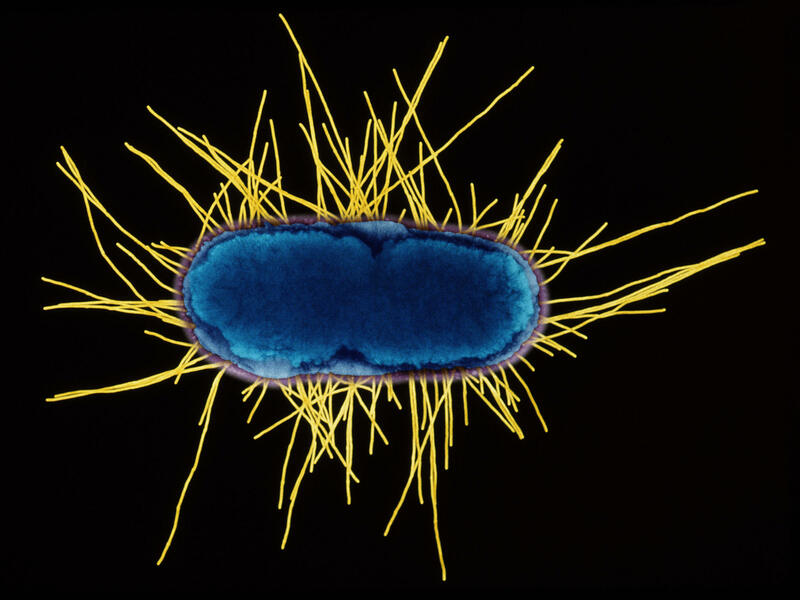 This rod-shaped bacterium moves via its hair-like flagellae (yellow). Mutations have been studied for centuries, says Lydia Robert, a researcher at INRA, an agricultural research institute in Paris, France, who notes that they can have medical impacts ranging from antibiotic resistance to cancer. But research on mutations basically has focused on large-scale effects in populations. "You have a test tube with millions of bacteria, for instance, and you try to measure some property which is an average of all the cells in the population," says Robert. In contrast, she and her colleagues wanted to study mutations in single cells. So they turned to a so-called "mother machine" — a microfluidics device equipped with hundreds of tiny tubes, each no wider than a single E. coli bacterium. They trapped a single bacterial cell in each tube, and spied on them with a microscope. Every time the bacterial cell divided into two, to reproduce itself, its genetic material got copied. If that copying process went awry and made a mistake, producing a mutation, this error got flagged by a fluorescent tag. The research team tracked about 20,000 mutations over hundreds of generations. The researchers first checked to see if some cells might have an increased mutation rate compared to others. "We were surprised that in fact it was not the case," says Robert, explaining that, under their experimental conditions, all the cells seemed to share the same probability of acquiring mutations, and these genetic changes seemed to occur at a steady rate. "Many, many of them had no effect at all. This was a bit of a surprise to me," Robert says. "I would have expected a lot of mutations to be slightly bad, and they are not even bad at all." Just one percent of the time, a mutation killed the cell outright. And a mutation was very harmful to a cell (but not lethal) about 0.2 percent of the time. "Most of the time it's really neutral. The cell gets a mutation but it does nothing to the cell," says Robert. In this study, the bacteria in the little tubes were living under good conditions and weren't exposed to any natural selection or competition—so the researchers could not determine how often mutations produced a beneficial effect that enhanced the bacterial cells' growth and survival. Future studies could start to explore that. "We're going to change, basically, the environment and see what it changes," Robert says. "What happens if the environment is harsher? Is it going to change the way mutations occur, or are they going to kill more of the cells or less of the cells?" Already, what the researchers have observed so far confirms a lot of the core thinking that goes into evolutionary biology, says Richard Lenski, a biologist at Michigan State University who has spent the last three decades following the evolution of bacteria populations living in flasks in his lab. "What's exciting about this paper is the technical elegance of it, the rigorous quantification," says Lenski, "This is another nice demonstration that random mutation really has this kind of clock-like dynamic, and that, absent natural selection, populations will, in fact, not only not be able to hold their own, but will tend to decay over time," because most mutations are either neutral or deleterious. Looking at mutations without any natural selection is very artificial, Lenski says, "but that allows them to really focus on the underlying process of mutation." Some people study evolution in the real world, in all its gory detail, he says. But there's also value in studying genetic changes in this kind of controlled setting that can give a cleaner answers. "Fitting those two together is always a challenge," says Lenski, "but that's the way science works."